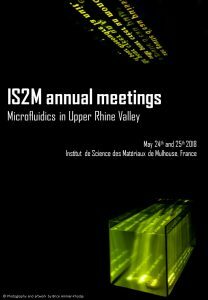 This year, the IS2M annual meetings will focus on microfluidics. During these two days, scientists from the EUCOR network – the European campus, will present their latest findings in this field. This conference aims to provide a forum for EUCOR scientists, and more generally for scientists concern by microfluidics or any related research. The scientific committee of these meeting is thus composed by scientists from the EUCOR network (Uni Basel, Karlsruher Institut für Technologie , UNISTRA and UHA). Additionally to the EUCOR speakers, three keynote speakers from Germany, Swiss and France will be specially invited for this event.